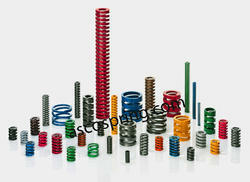 Our range of products include industrial flat springs and flat coil die springs. Owing the team of expert engineers and workers, we are engaged in offering high quality range of Industrial Flat Springs. Industrial Flat Spring are widely used in various applications and are manufactured as per the requirements of our clients. Further, the raw material used in the manufacturing is procured from the reliable vendors of the industries. Looking for Flat Wire Springs ?